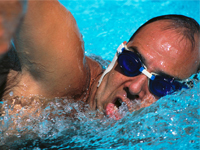 Swimming is a great way to get fit. We have swimming pools at Hermitage and Hood Park Leisure Centres and Ibstock Leisure Complex. And we have a fantastic outdoor pool at Hood Park Leisure Centre - open May to September. If you are a regular swimmer or become one, why not join the Fitness Membership Scheme and pay by direct debit? If you're disabled or on a low income, why not become a Leisure Link member? You could qualify for free swimming.